I am looking for information regarding a sword, shown below, now at the Metropolitan Museum of Art. (04.3.21). This sword is discussed in Spanish Arms and Armour: Being a Historical and Descriptive Account of the Royal Armoury of Madrid, by Calvert, Albert; Heroic Armor of the Italian Renaissance Filippo Negroli and His Contemporaries, by Stuart W. Pyhrr, Jose-A. Godoy; and Armi Bianche Italiane, by Boccia, Lionello G. ; Coelho, Eduardo T.
The particular info I'm having a hard time resolving is the association of this sword to the "Damascened Garniture of Charles V" by the Negroli brothers, circa 1550. 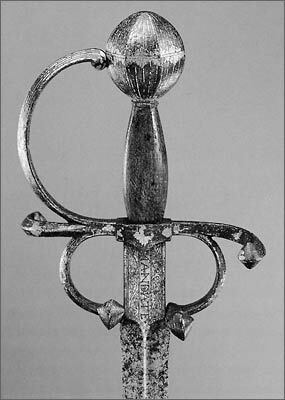 I am specifically trying to find if this sword can be confidently associated with Charles V. It made its way into the Met through the Rogers Fund in 1904 from the Real Ameria, Madrid (RA g 34). Perhaps one of you could read section 38 in Heroic Armor of the Italian Renaissance Filippo Negroli and His Contemporaries and see if you can gleam any further answers than myself.